I was digging through my box of material and I came across some old scraps of fabric and I was suddenly possessed to make some bunting. 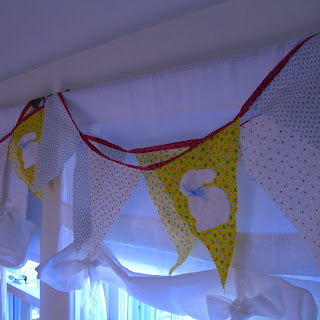 My husband tells me that bunting isn't really used in America ... but having done some research - it seems that it is indeed an American thing: "A lightweight cloth material often used for flags and festive decorations (American)." So I made my bunting - and it was SO pretty ...... I want to keep it. 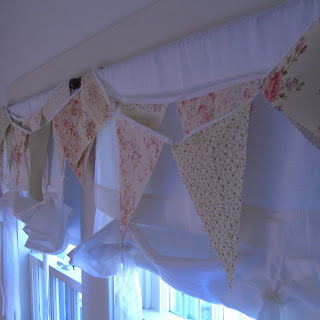 But then I became possessed by bunting fever (careful - it is so pretty and quick to make it becomes addictive!) 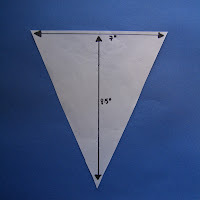 And what would be perfect for bunting?? well bunnies of course! 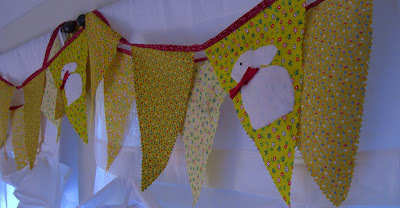 So along came my Bunny Bunting - which would be perfect for Easter, picnics or children's parties !! 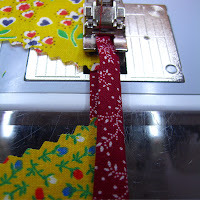 Bunting is also a perfect (and decorative) way to use up odd bits of material and I fear I should have really used recycled fabric ....but perhaps I can do that for the next bunting project! 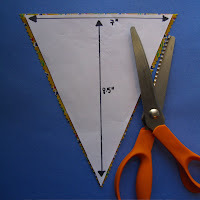 My flags have been cut using pinking shears and I made the pattern up as I went along - but I have found a lovely pattern for making double sided bunting at Whip Up I think this looks quite delicious and would be a wonderful gift for a new born baby. 3) Add the flags one by one leaving just under an inch between each flag. 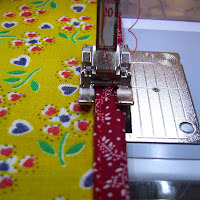 3) Ensure you sew 14" of the bias tape together at the end of the bunting. Now I just need a pattern for the bunny!! 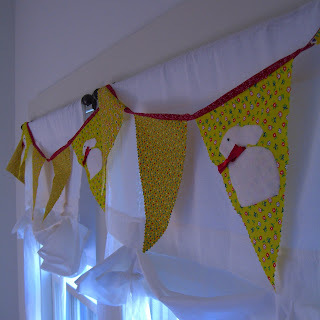 My little rabbit loving 6 year old will go crazy if I make bunting like this for over her windows. Thank you for the idea! i love it and thanks for the tutorial. i think i'm going to try my hand at this! > Great bunting, especially the pretty pink one, and I love the bunnies on the Easter one too. I paid £2.99 for mine.